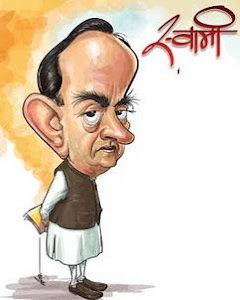 Know your Swamy: Swamy uncovered! The Kesri article alleges that Chidu refused to back down even after one of the trustees approached former Attorney-General G Ramaswamy to broker a rappochement. In the end, former Prime Minister Chandra Shekhar had to intervene to ensure that Deve Gowda stopped the proceedings. The least you can do to get some credibility to this ranting is disclose your identity. Otherwise you are just a hired assassin for character assassination. Aren't the Chinese doing just that for last 20 years? You and your posts are a disgrace. Cut your hagiographies. Almost all posts in this blog have either come from Swamy's mouth or pen.Few others are based on articles that have appeared in mainstream media. How can you term anything a disgrace? Isn't Swamy our demi god? We have no respect for his views? LOL, nameless troll... u were trying hard to get visibility on other blog... so as a return, u get this comment back... happy with ur 15 sec fame... now go change ur diapers!!! My fame is Swamy's fame and so I stand nameless. What are you worried about? Diapers? Lol.. I think this joker swamy has the ambition of being PM. He got a magic bullet called 2G and that is his 5 minutes of glory.